Hotel Vajra is built in the typical Nepali pagoda style, jeweled inside and out with wood and terracotta carvings, stone and marble tiles, hanging brick gardens, and traditional Tibetan ceiling-paintings. Guests can enjoy an art gallery, a classical dance studio with weekly performances, an East-West library, an ayurvedic massage room, the Pagoda Bar, the Pagoda Hall for meditation or yoga, the Naga Theater with yearly drama performances by Studio 7, and a cluster of ﬂower trailed gardens.The rooftop gardens give magnifcent morning and sunset panoramas of Durbar Square’s pagodas, as well as of the 2000-year-old swoyambhunath. 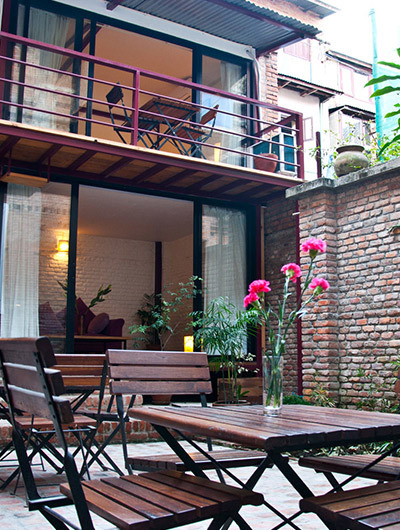 The Hotel Vajra is situated on the foothills of the Swayambhunath Stupa and its age old pilgrim road, also near the Bijeswori Temple complex, two of the power places of the Kathmandu Valley. The Vajra is surrounded by trees and flower trail gardens, creating a place of serenity and beauty, overlooking the entire Kathmandu Valley up to the snow peaks of the Himalayas. And on any early morning you may join the pilgrims – Nepali, Tibetan, Bhutanese, in-fact, you may see a Buddhist from any part of the world on their ascent to the great 2000 years old Swayambhunath Stupa.